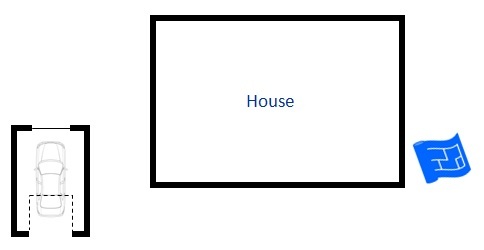 Most homes have at least one car and maybe two or three. That adds up to a lot of garage space. 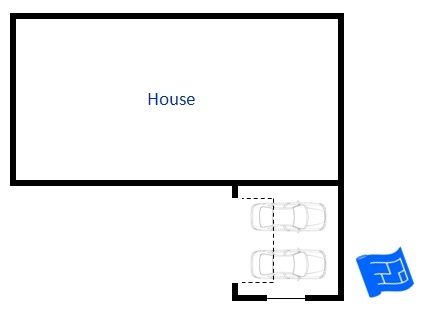 The location and shape of your garage can have a big impact on your home so this page explores some options for your garage floor plan and we'll discuss the impact of each one. This page is part of the garage design series. 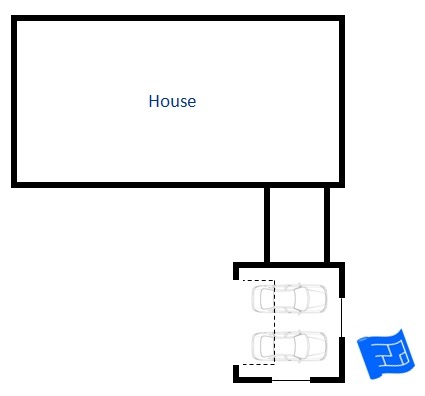 When you're looking through these examples of garage arrangements, bear in mind that the discussions generally apply whether the garage is a single, double or triple garage. So let's start with the location of your garage if it's attached to your home. 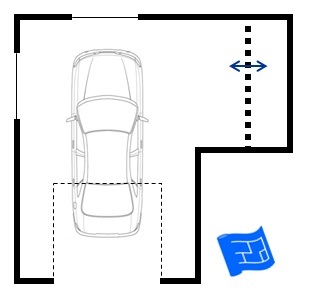 The great advantage of attached garage floor plans is that they form a part of the home. So if you use your garage frequently for coming and going, for storage that you access often or for one of the alternative activities outlined on the garage design page it's not far to go and you don't have to go outside. The fact that they form part of the home means that if you want lots of upstairs accommodation this can flow seamlessly on the top floor, taking advantage of the increased square footage on the ground floor. This is a very common arrangement with the garage nestling within the house. 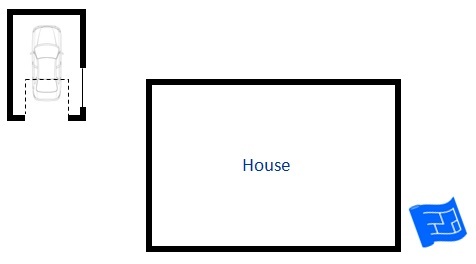 The facade of the house might be flat with the facade of the house or slightly off-set (could be set slightly forward or slightly behind the line of the house). Most architectural styles look more interesting if an off-set is used. The thing to bear in mind with this design is that the garage takes up a significant portion of the facade of the home. The garage makes a big visual impact and also prevents light entering the home from a significant length of the front elevation. 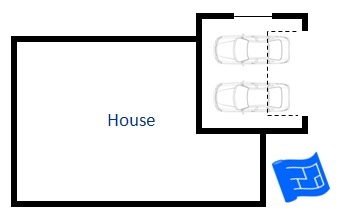 In this next example the garage is attached at the side of the house forming a separate block but still attached. In this arrangement there is less visual impact and less impact on the light that's available to the house. 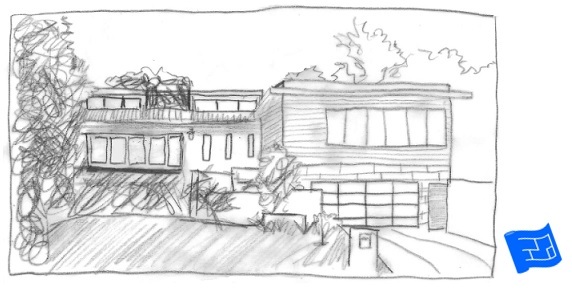 Of course a front facing garage at the side of the house can be placed at any location along the side of the house. To diminish the impact on the front of the house you can move the garage back. Here's a long attached garage. 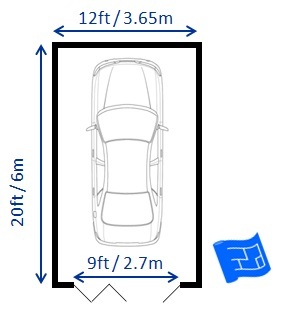 It's single garage width but could be used to accommodate two cars. This garage has a connection both with the front of the house and the garden. Maybe the back section of the garage could be used for garden storage or an indoor seating area. There's large access doors both at the front and rear. See how this set up creates a corner nook at the back of the house which gives a sheltered feeling. In temperate climates this creates a lovely warm sun trap if it faces towards the sun, the heat is caught in the walls. Side facing garages need a bigger lot to allow for the driveway space to give side access. The fact that the garage doors no longer form part of the curb facing side of the house means that windows can be placed in the garage wall which can blend better with the appearance of the house. Here's a side facing garage towards the back of the home. If the best view and light is available at the front of your home this is a better design than having the garage at the front of the house. 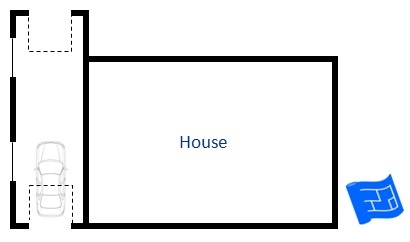 Here's a garage floor plan with the garage out front and perpendicular to the front. This is a nice arrangement giving a real sense of arrival to the home. 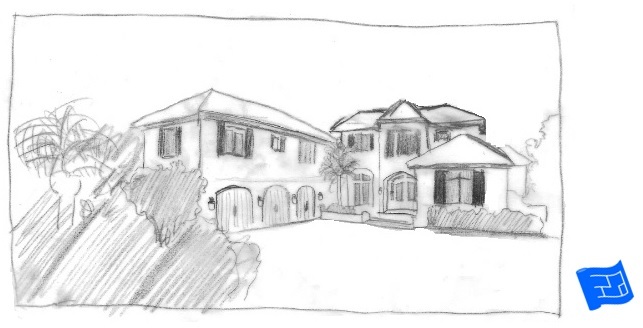 Here's one of my sketches again to try and demonstrate that courtyard feeling. 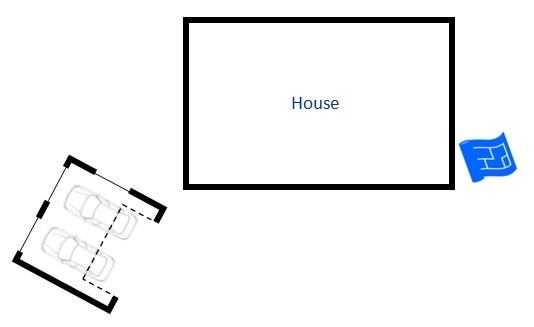 It's the other way round to the floor plan above and a triple rather than double garage. Some lots have rear access. All the examples presented above work for rear access conditions as well. Think about your lot and where the best light and sun (or shade depending on your climate) are and adjust the position of the garage to work with the way you want to use your house and outdoor areas. If you're on a sloping site which slopes parallel to your house of down towards the front of your lot a great place for the garage is underneath your home. 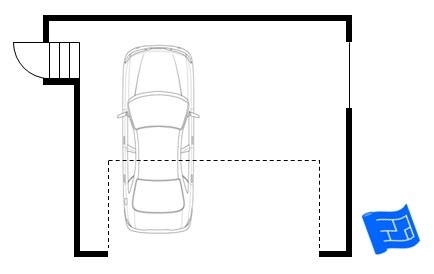 Or equally, you could lift all your accommodation up a level (maybe even get a better view) and put your garaging on the ground floor. 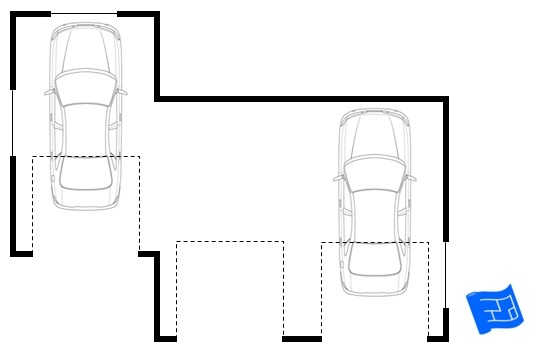 So now let's move on to garage floor plan arrangements of detached garages. I notice that most of the pictures I've got in this section are of single garages. 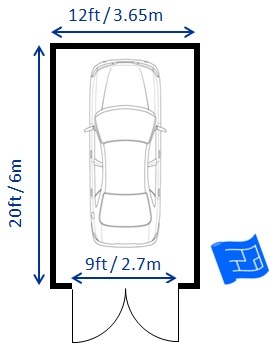 Just remember that single garages don't give many options for accommodation above, they're a bit small. The best argument for a detached garage floor plan is if you specifically want some separation between your garage and your home. For example, if there's going to be a noisy workshop in the garage this might be better set away from the home. Here's a garage set forwards of the house. Make sure you have enough driveway here for backing out. Much like attached garages, think about the way your house faces, what you need (shade or sun depending on climate) and think about where the garage needs to be to facilitate what you want in your outdoor areas. Here the garage is set further back towards the back of the house. Here's a garage at an angle to the house. I'm not sure I'd go for this floor plan over a forward, side or rear facing garage, but you might need to if you want to preserve something on your site like a water feature or a tree. Next comes my favorite detached design but it's sort of attached and detached all at the same time because it's a garage and breezeway combination. The garage can be to the front or the side. I particularly like the idea of this. The breezeway provides a transition between arrival into the garage and arrival into the home. Throughout these garage design pages we've talked about garage storage and how best to fit it in. 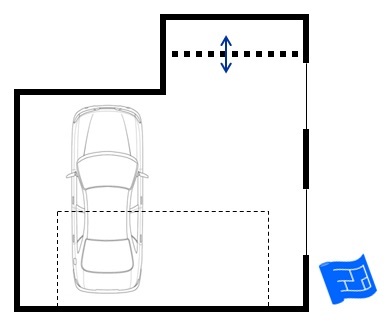 One idea is to include what I call a 'storage alcove' in the your garage floor plan. It can vary in depth and works particularly well with attached garages as other parts of the house can be worked into the remaining space such as an entry space, stairwell or guest bath. Here's two examples. 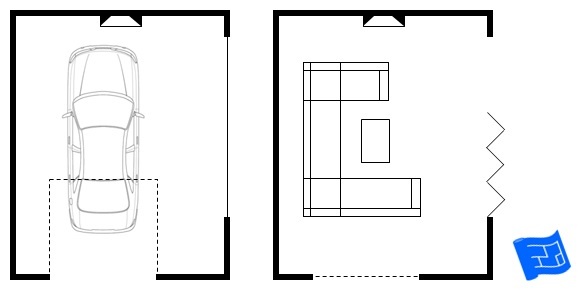 The dotted lines represent the fact that the alcove can be of any size. Just enough to fit some shallow shelving, or big enough to store whatever you have in mind. Usually there's a change in level between the garage and the house. If you're on a flat site this is just one step. If there are more steps it these can be an obstruction to parking your car. 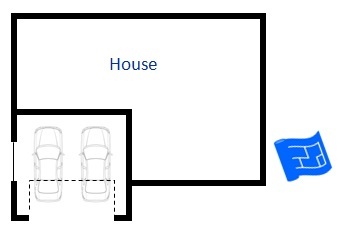 The door should open outwards from the garage so that when you're entering the garage the door doesn't open directly onto the steps. The act of opening the door means you have to step back. It's safer that way. 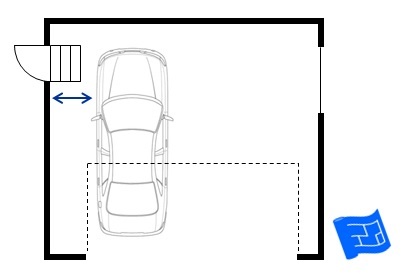 This problem can be solved by adding storage or altering the garage shape to shield the parking space from the steps. The location of the garage door moves to accommodate the new garage shape. Garage shaped to sheild the steps from the parking area. If you feel that the frontage of your garage is a bit visually overwhelming then consider breaking this up by offsetting one of the garages. 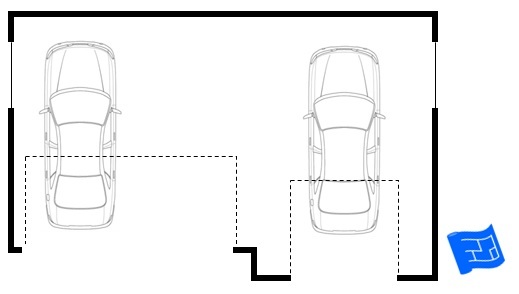 The garages can be offset slightly, keeping the back of the garage as a straight line. Or you can try staggering the garages. 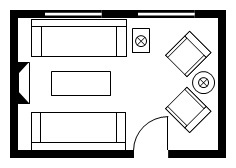 When I saw this garage floor plan I had to include it. That's right - that's a fireplace in there on the back wall. This garage can be used to park the car during winter and during warmer months the car is parked up elsewhere and the garden furniture takes it's place and the garage serves as a summer house. The bi-fold windows can be opened if it's warm enough. This section is just to remind you that not all garage doors need to open upwards. 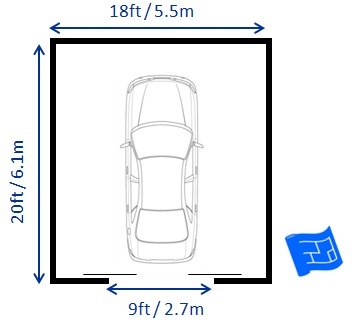 Would any of these door arrangements serve your garage design needs?